The very first Porsche 356 of 1948, known as Number One, was powered by a 35-hp, 1.1 liter flat-four motor situated amidships. Significantly, it was an open car and thus the ancestor of the we drove in Greece this weekend. 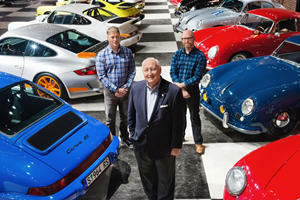 The open sports car lineage remained unbroken over the years and Porsche has always had Cabriolet, Speedster and Spyder models in its range. The first Targa of 1967 was created in response to threatened US rollover regulations that never happened, but it's reinforced structure laid the groundwork for the first 911 Cabriolet that arrived with the 911SC, and has been an important model in the 911 family ever since. Unlike its predecessors from the G-Series onwards,. That gives both Coupe and Cabriolet models a tougher, more purposeful look that's emphasized by the use of 20-inch diameter wheels in front and 21-inch diameter wheels at the rear for aesthetic balance. The steeply raked front windscreen works with the new soft top to create a car that looks sleek and rakish when its roof is in place. It is very close to the Coupe in silhouette, and this is borne out in the wind tunnel by its 0.3 drag coefficient, which is only a tad worse than the 0.29 of its fixed head sister. In fact, this slight degradation is not caused by the roof but is rather a function of the extra strengthening members under the floorpan compromising some of the plastic panels that create a more completely flat underbody for the Coupe. The front of both models is identical as are the doors. The new exterior sheet metal begins aft of this where the wheel arches now blend upwards into a neatly styled rear deck profile that helps the Cabriolet look good whether its soft-top is up or down. At the extreme rear, the active rear spoiler is the same, but on the Cabriolet the control programming adopts the three-position algorithm normally reserved for cars with the Sport Chrono Package. In this case, the third position is used when the roof is down since the airflow is then quite different. The industry norm for comparison of the torsional stiffness of a car's bodyshell has always been a static measure, gleaned by placing the bodyshell on a jig that applies twisting forces at defined points to elicit a defining figure in terms of Nm/degree. However, this static test does not realistically show how a bodyshell will react to loads being fed into it from the suspension and sub-frames under hard cornering or over bumps on real-world roads. Based on Porsche’s new MMB platform, the 992 Cabriolet enjoys a 10% greater static torsional stiffness than its predecessor. More importantly, its dynamic torsional stiffness also shows a 10% improvement, a number Porsche’s engineers are justifiably proud of, but which has never been openly announced on a launch event before. With a frame made from steel, aluminum and magnesium components the roof cycles up or down in a swift 12 seconds, and can be operated on the fly at up to 30 mph. This finessed new roof, its mechanism, and the structural reinforcement to the body-in-white extracts a 154 lb weight penalty over the Coupe. Given that it has an occasional rear seat to cover as well this is reasonable and makes an interesting comparison with the 194 lb extra weight carried by the much smaller solid folding roof of the Ferrari 488 Spider. The rear wind deflector is also a new design and motors up or down in about two seconds. With the side glass up the combination provides a remarkably draft-free drive, and I noted significantly less air swirl in the cabin than in the Boxster I drove a few weeks before. When in place the triple layer fabric roof insulates the cabin from the elements very effectively, and unless you glance over your shoulder you could just as well be in the Coupe. From the front seats, the Cabriolet and Coupe are identical apart from the switches that operate the roof and rear wind deflector. Thus the instrument pack with the big rev counter remains the analog centerpiece, and is all that remains visible when you switch off the ignition and the electronically generated readouts on either side go dark. The 10.9-inch widescreen display is intuitive to use, and the quality feel and precision of the five shortcut switches positioned under the screen is pleasing in use. The rear reversing camera whose image appears on this screen is a standard fit on the Cabriolet. Another is the big, clear "M” for Manual button behind the small transmission lever that locks the transmission in the ratio you choose with the paddle shifter. This is important as the PDK gearbox software will otherwise automatically shift up or down even in Sport Plus mode. The seats in our test car had fabric center panels, which we prefer to leather because it is warmer in winter, cooler in summer, and holds you better in cornering. The engine and gearbox of the 992 Carrera S Cabriolet are identical to the Coupe. This means the latest 9A2 Evo, 3.0-liter twin-turbo flat-six with the revised intercooler and intake arrangement punching out 450 hp at 6,500 rpm, with 391 lb-ft of torque on tap from 2,300 to 5,000 rpm. With the cut-out set at 7,500 rpm there is plenty of headroom when you need it, and the strong low-end punch coupled to a soaring, feral top end delivers the best of both worlds, and makes for impressive flexibility with no loss of the distinctive flat six character. And of course, the aggressive full throttle soundtrack with the exhaust in Sport mode is emphasized with the roof down. The new eight-speed PDK twin-clutch transmission is the perfect partner for this lusty turbocharged engine. Its closely stacked gears provide a gear for every occasion, and where each ratio ends the next instantly takes over to keep the torque-rich motor on the boil. With the tall eighth ratio making for relatively relaxed highway cruising - 75 mph corresponding to around 1,600 rpm for instance - a tank of fuel goes even further than before. However, this depends on how you drive. We noticed that economy was good if we left the gearbox to its own devices, and that consumption rose steeply when we used the ‘M’ button and paddle shifts on entertaining stretches of twisty roads. As top speed is achieved in sixth gear, the tall seventh and eight gears effectively provide two overdrive ratios. A manual gearbox has been promised for September this year and will be the base transmission from then on. Despite being larger and 110 lb heavier than its predecessor at 3,494 lb (Carrera 4S Cabriolet, 3,604 lb) the 992 Carrera S Cabriolet is significantly more rapid. The Sport Chrono Package equipped Carrera S Cabriolet now takes just 3.5 seconds to cover the 0-60 mph sprint (991.2 4.1 sec), with 100 mph attained in 8.2 sec. Top speed is marginally up by 1 mph to 190 mph. The latest version of the twin-turbo flat six is potent enough for an open car and should satisfy the vast majority of owners. We pushed the car hard through the bends on our coastal test route, and it turned in on cue, felt agile mid-bend, and rocketed out the other end with gusto and the occasional wiggle of the tail just to remind us we were in the rear wheel drive version. Porsche brakes always have excess capacity and the standard steel brakes proved powerful and easy to modulate, and while we tend to prefer the PCCB brakes on a Coupe, the ones with the red calipers work just fine in the Cabriolet application. 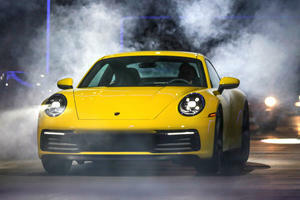 Porsche are one of the few manufacturers whose electric power steering no longer draws adverse comments from enthusiasts. In fact, we did not notice it during our test drive, which is probably the biggest compliment possible. The improved structural stiffness is apparent from the comparative lack of scuttle shake on bumpy roads, and the new 992 Cabriolet dives for apexes and jumps out of corners with even more confidence than before. 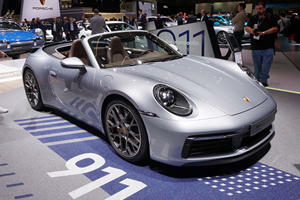 Unlike some mid-engine rivals, its limit handling is more linear and predictable and less upset by having the top down. The other change in design philosophy that makes a difference to the driving dynamics of both Coupe and Cabriolet versions is the more forward location of the engine mounts that helps to reduce the polar moment of inertia at the rear both in cornering and over bumps. In sum, because the suspension geometry now stays closer to optimum under load the gains in handling and ride are real, and the dreaded scuttle shake, the bane of all open cars, is also kept in check. That said, as with all convertibles, you can still feel an increase in rigidity on a bumpy road with the roof up, and the handling does benefit from this when you are really pressing on. The 2020 911 Carrera S Cabriolet has a base MSRP of $126,100, while the Carrera 4S Cabriolet starts at $133,400. The $1,250 delivery, processing and handling fee is extra. Start adding the options and that . Our German spec test car had a long list of extras including its Lizard Green paintwork, PASM Sport suspension, and Bose audio system. An equivalent US spec car would cost $153,780 including delivery. The specification differences between US and ROW models include no Eco-Mode spoiler setting, with the spoiler rising at 56 mph when the roof is closed, no gas particulate filter, US-specific functionality for the optional LED matrix lights with no selective highbeams, and no convertible top operation via the key fob. Porsche has had a lot of practice making open versions of their sports cars, and the 992 Carrera S Cabriolet stands at the pinnacle of this experience. 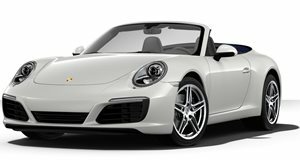 This is a versatile and practical car you can use every day, and if you live in a climate where winter conditions are an issue, the Carrera 4S Cabriolet is the answer. Pricing starts at $127,350 in the US.